If you live in Ohio and have felt wet and miserable the past year, you now have vindication. Based on the long-term record from the OARDC weather station, Wooster has just completed it’s third wettest year on record (i.e., since continuous record-keeping began at the OARDC in 1900). I know, it’s the first week of October, but in the hydrology world, the “water year” typically begins on Oct 1. This makes sense if you think about agriculture — water falling in Oct-Dec of 2018 isn’t all that helpful for most crops growing in 2018, but it can replenish surface reservoirs and/or groundwater for 2019. Therefore, the 2018 water year just ended Sunday. Figure 1: Annual precipitation at the OARDC station in Wooster, Ohio by water year beginning Oct 1, scaled to a 365-day year. The record extends 118 years: 1901-2018. Linear (red) and cubic (green) fits to the dataset are also included. The total precipitation in 2018 was 50.17 in., which fell about an inch short of the record, set in 2004 (51.18 in.). The only other year with over 50 in. was 1996 (50.81 in.). Both 2004 and 1996 were leap years, but even if you adjust precipitation to 365 days per year, 2018 still ranks third. 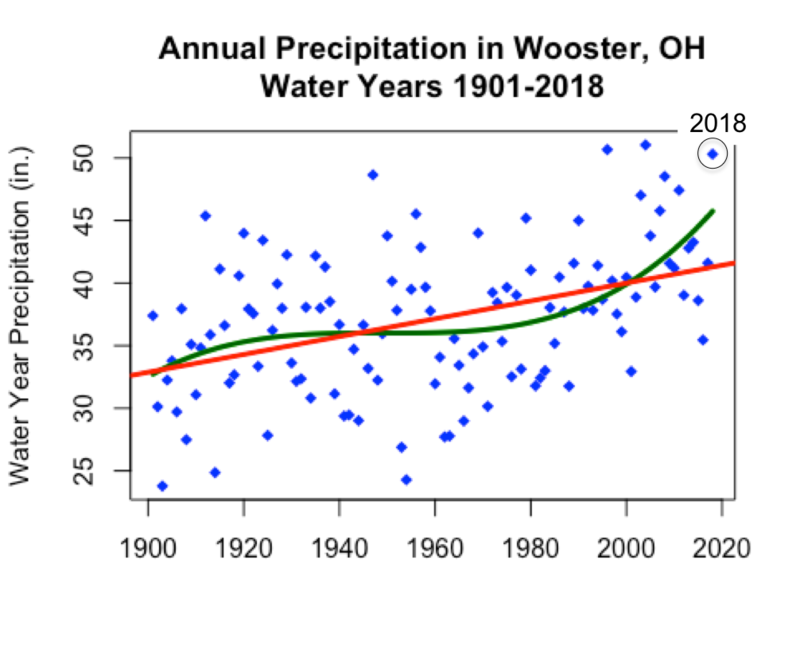 Another interesting thing to note is that the annual precipitation in Wooster has been increasing over the past 118 years. On average, the change is about 0.07 in./year. That might not sound like a lot, but over 118 years, it adds up. In the past decade (2009-2018), Wooster has received 102.6 in. more precipitation than the period 1901-1910. In other words, we’re getting about 32% more precipitation in the 2010s than we did in the 1900s. A linear trend is pretty good for explaining this long-term change, but you might notice that most of the change in annual precipitation takes place in the periods 1900 to 1925 and 1980 to today. The green curve is a little better at fitting the data and better captures the mid-century stability and the rapid increase in wetness over the past few decades. Figure 2: Histogram of Aug-Sep precipitation in Wooster with the extreme years of 2017 and 2018 indicated. One more thing that’s interesting to note is just how different late summer was in Wooster this year compared to last. 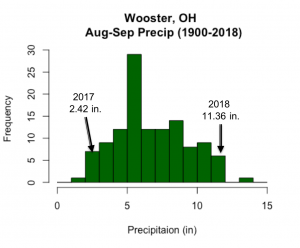 The Aug-Sep period of 2017 was one of the driest on record in Wooster (even though the year overall was unexceptional). Only 2.42 in. fell in Wooster then. On the other hand, 2018 was one of the wettest years on record, with 11.36 in. falling. Only 3% of all Aug-Sep periods were drier than 2017, and only 4% were wetter than 2018. What a difference a year makes!